Conor McGregor, a mixed-martial arts superstar, has been arrested and charged with strong-arm robbery, according to the Miami Beach Police Department. 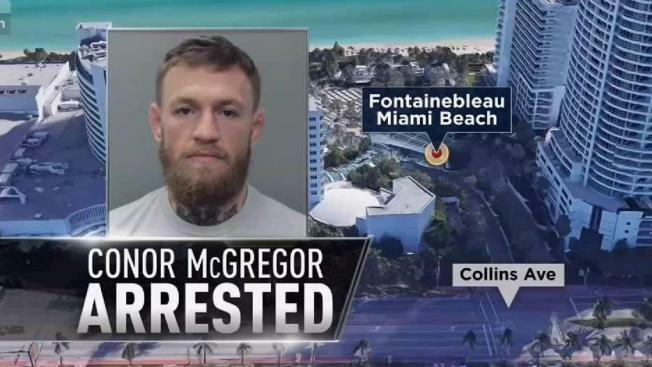 An arrest report said the incident occurred Monday at about 5 a.m. after a man approached McGregor and attempted to take a picture of him while exiting the Fontainebleau Miami Beach hotel. "The defendant slapped the victim's phone out of his hand, causing it to fall to the floor. The defendant then stomped on the victim's phone several times, damaging it," the report reads. McGregor, 30, then picked up the 22-year-old man's phone and walked away, according to the arrest report. The man told police the phone was valued at $1,000. Police later located and arrested McGregor. Police charged McGregor with one count of strong-arm robbery and one count of criminal mischief valued at $1,000 or more. McGregor posted bond and left jail hours after his arrest. "Conor McGregor was involved in a minor altercation involving a cell phone that resulted in a call to law enforcement. Mr. McGregor appreciates the response of law enforcement and pledges his full cooperation." McGregor, whose most recent UFC fight was a tap-out loss to Khabib Nurmagomedov in October, pleaded guilty last year to disorderly conduct in exchange for community service due to a backstage brawl in New York City. McGregor's probation period for that case ended less than a week prior to the Florida arrest.